Natural microbial communities (C.H. Robinson, K.D. Bruce). The characterisation of microbial communities in environmental samples (N.R. Parekh, R.D. Bardgett). The role of microorganisms during sediment diagenesis: implications for radionuclide mobility (K.O. Konhauser, R.J.G. Mortimer, K. Morris, V. Dunn). Biogeochemical cycles and remobilisation of the actinide elements (K. Morris, R. Raiswell). The effects of humic substances on radioactivity in the environment (R.E. Keepax, D.M. Jones, S.E. Pepper, N.D. Bryan). Microbial interactions with metals/radionuclides: the basis of bioremediation (G.M. Gadd). Microbial redox interactions with uranium: an environmental perspective (R.T. Anderson, D.R. Lovley). Diversity and activity of bacteria in uranium waste piles (S. Selenska-Pobell). Microbial effects on waste repository materials (J.M. West, I.G. McKinley, S. Stroes-Gascoyne). Microbial processes in the disposal of high level radioactive waste 500m underground in Fennoscandian Shield rocks (K. Pedersen). 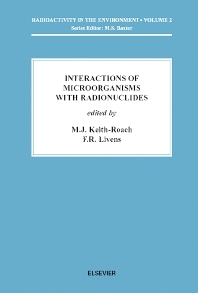 Biochemical basis of microbe-radionuclide interactions (J.R. Lloyd, L.E. Macaskie). Microbial interactions with radioactive wastes and potential applications (L.E. Macaskie, J.R. Lloyd). Microbial interactions with radionuclides - summary and future perspectives (M.J. Keith-Roach, F.R. Livens). Many environmental processes are influenced, if not controlled, by microbial action and it is becoming increasingly important to develop an understanding of microbial roles in geochemistry. This book brings together state of the art research into microbiological processes and the extent to which they affect or can be used to control radioactive elements. The basic principles and fundamental mechanisms by which microbes and radionuclides interact are outlined, the methodology described, potential microbial influences on waste repositories examined, direct and indirect effects on transport both on local and global scales considered and potential technological applications identified. The book is directed towards advanced undergraduate students, postgraduates and researchers in the areas of environmental radioactivity, environmental microbiology, biotechnology and radioactive waste management. It will also be of interest to regulators, policy makers and non-governmental organisations. This novel and timely book offers a fully integrated approach to a topical international issue.